Nitrate poisoning is a condition which may affect ruminants consuming certain forages or water that contains an excessive amount of nitrate. Horses are much less sensitive to nitrate toxicity since they are hindgut ferments and do not have a rumen. Nitrate is converted to nitrite faster than nitrite is converted to ammonia. Consequently, when higher than normal amounts of nitrate are consumed, an accumulation of nitrite may occur in the rumen. Nitrite then will be absorbed into the bloodstream and will convert hemoglobin to methemoglobin, which is unable to transport oxygen. Thus, when an animal dies from nitrate poisoning, it is due to a lack of oxygen. The occurrence of nitrate poisoning is difficult to predict because nitrate levels can change rapidly in plants and the toxicity of nitrate varies greatly among livestock due to prior exposure, age, health status, and diets. However, concern should certainly be raised when plant growth has been less than half of normal or nitrogen application more than twice recommended. Plants normally take up nitrogen from the soil in the form of nitrate, regardless of the form of nitrogen fertilizer (including manure) applied. However, little nitrate accumulates in plants, when growth is normal, because the plant stem and leaves rapidly convert nitrate to plant amino acids and protein. Under certain conditions, however, this balance can be disrupted so that the roots will take up nitrate faster than the plant can convert the nitrate to protein. If any one of these factors is inadequate, the root continues to absorb nitrate at the same rate while storing it unchanged in the stalk and lower parts of the leaves. When this situation develops, nitrate accumulates. Nitrates may also accumulate in plants from excessive nitrogen fertilization, for example on fields where a large amount of manure has been applied. Some plants are more likely to accumulate nitrate than others. Crops capable of high levels of nitrate accumulation under adverse conditions include corn, small grains, sudangrass, and sorghum. Weeds capable of nitrate accumulation include pigweed, lambsquarter, sunflower, bindweed, and many others. Vegetables capable of accumulating large amounts of nitrate that are most frequently grazed include sugar beets, lettuce, cabbage, potatoes and carrots. Nitrates and nitrites are water soluble. They move with the water. Any nitrate added to, or produced within, the soil may be leached or washed away by moving water–either by surface run-off or ground water percolation. Nitrates are more concentrated below or near the area of waste accumulation or disposal such as manure piles, feedlots, septic tank disposal fields, cesspools, privies, etc. Excess nitrates also are more apt to be found in ground water under low areas and waterways that collect or convey surface water. Fractured bedrock may also enable the mixing of surface water nitrates into ground water. Water samples from shallow, dug, bored and driven wells more frequently contain excess nitrates than water from deeper, drilled wells. Nitrate levels generally are highest following wet periods and lowest during dry periods which may cause a false sense of security. Preferably, a well should be tested immediately following a wet period. Ruminant livestock can tolerate a wide range of nitrate, depending on several factors. The animal can become conditioned to eat larger amounts of feed with high nitrate content if the increase is gradual. Adequate amounts of available carbohydrates (grain) allow the animal to consume more nitrate because carbohydrates enhance the conversion process from nitrate to microbial protein. Rapid diet changes can trigger nitrate poisoning. Parasitism or other conditions causing anemia will increase susceptibility. Nitrate in more than one diet component (e.g. water and forage). Many general symptoms such as poor appetite, weak calves, lambs or kids, abortions, poor growth, and general unthrifty conditions are frequently blamed on nitrate. These and other problems can also be caused by a number of disease, nutritional or managerial problems. Therefore, it is essential to study the situation thoroughly before concluding that nitrate is the problem. Simple chronic nitrate toxicity is rare. More likely, high nitrate is only one of several factors resulting in poor performance. For example, poor performance on a ration that is low in energy or lacking in essential minerals is apt to be worse if nitrate is also present. When good feeding and management practices are followed, it is very difficult to produce chronic nitrate problems. Many factors have been suggested to explain the different results obtained in research trials studying the nitrate problem. Age, condition, and species of the animal, other chemical compounds and nutrients in the ration, and the types of nitrogen compounds in the feed or water are some of the factors that must be considered. The most dramatic nitrate toxicity problems have occurred when hungry cattle were put on corn stalks, oat straw or weedy pasture or fed freshly chopped, drought-inhibited corn plants. Under these conditions the highest nitrate feeds are fed as the total ration, and the feeding of well-balanced rations and adaptation by the animal are ignored. The ensiling process diminishes plant nitrate content as some nitrate-nitrogen comes off as silo gas, nitrogen dioxide. Sudden change to high nitrate corn silage as the main feed can cause problems. Milking cows and other animals receiving large amounts of grain are not as likely to have nitrate toxicity problems as dry cows, heifers and other animals because the milking cows are on a higher energy ration and because the high nitrate feedstuff is likely to be a smaller proportion of the total diet. Grains and other concentrates are low in nitrate. Forages (leaves and stems) will accumulate more nitrate than grains. Because forage comprises a larger percentage of ruminant diets, high nitrate in feed is more likely to be of concern in feeding ruminants than non-ruminants. However, nitrate from feed or water can cause problems for all animals and to humans. If fresh-chopped forage or silage is suspected of being high in nitrates, it should be tested. Samples can be analyzed by some commercial forage testing laboratories as well as by the University of Wisconsin Soil & Forage Analysis Lab (8396 Yellowstone Dr., Marshfield, WI, 54449). To make sure the sample is representative of the feed or water that is being analyzed. Take at least 5 separate samples. Mix well and remove about 0.5 lb for testing. Collect several handfuls from different loads or different parts of a load. Cut at least 15 whole plants taken at random. Cut plants at same height as field chopper. Chop plants into one-half inch lengths and mix well. Remove about 0.5 lb for testing. Preventing nitrate loss in the sample before analysis is critical to getting accurate results. This is difficult in silages and fresh forages therefore it is best to take fresh silages and samples directly to the laboratory. If samples must be held or shipped, samples should be frozen or dried before shipment. Alternatively, dry samples by spreading in a thin layer on clean paper to dry. Artificial heat is desirable, but the sample should not get about 160°F. Fresh forages will ferment in airtight bags and for this reason are usually dried. Silage samples are usually frozen. Samples should be tested for both nitrate and nitrite as some nitrate will convert to nitrite while sample is being taken to the laboratory for analysis. It is recommended to request both nitrate and nitrite analysis. Water samples should be collected in special water sample bottles obtained from the laboratory or from the health agency in the area. To obtain a good sample of water from a well, let the water run until water in pipes and pressure tank has been discharged. It is comparatively easy to get a good water sample and the laboratory analysis is also more standardized. There is less variation in test results from water than feed. However, nitrate levels in water can vary considerably from month to month. Results of analysis on the same sample of feed can vary considerably due to limitations of chemical test used. Variations of 100 parts per million in a feed are well within the range of expected errors. Results of tests on feeds containing small amounts of nitrate might appear large but could be within the normal tolerance of test used. For example, if a report on one sample of silage shows 200 parts per million of NO3-N and another report shows 300 ppm of NO3-N, they are for all practical purposes the same. If reported as percent, the variation does not appear as large. In the above example, the percent NO3-N is .02 and .03. Results of nitrate analysis may be confusing because of the variation in methods of reporting. In the chemical analysis for nitrate, the actual element determined is the oxidized nitrogen. However, values may be reported as percent nitrate (NO3), or nitrate-nitrogen (NO3-N). Efforts have been made to have nitrate analysis and tolerances for safety uniformly reported as nitrate-nitrogen on 100 percent dry matter basis. However, at present, reports may be given as nitrate or nitrate-nitrogen and may be reported as either percent or as parts per million (ppm). Example: 0.1 percent equals 1000 ppm. Example: 750 ppm equals 0.075 percent. With all the biological variation that can exist in both plants and animals, it is obviously difficult to develop specific guidelines that fit all conditions. Safe levels of nitrate are not specifically known for all the various livestock feeding conditions. At the same time, some general guidelines are needed. The concept in developing the tables that follow is to be conservative to help assure safety. At the same time, reasonable feeding and care of the animal is assumed. There are two kinds of possible toxicity that are of concern: (1) Acute or lethal and (2) Chronic or non-lethal. Example: 35 grams, or 2.5 grams per 100 pounds of weight – possible danger. Nitrate content of water is usually reported as ppm but both NO3 and NO3-N are used. Conversion factors are the same as those in table 1. Example: 10 ppm of NO3-N is the same as 44 ppm of NO3 (nitrate). If reported as milligrams per liter (mg/L), this is the same as parts per million (ppm). 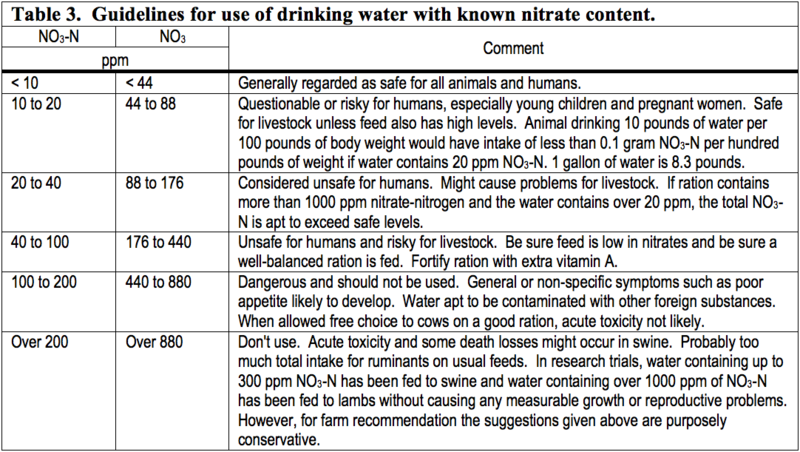 Guidelines for the use of drinking water with known nitrate content are presented in table 3. Toxicity or safety of a feed containing more than normal amounts of nitrate involves many factors. These include total daily intake of nitrate, previous adaptation of the animal to high nitrate, feeding practices, nutritional quality of the ration and general health of the animal. In addition, the nitrate level of the water may be a contributing factor. The following are the major factors that influence possible nitrate problems. Preventing or minimizing a causative factor will help decrease or prevent the problem. Total nitrate intake is the critical problem rather than the amount in any one feed in the ration. For example, a dangerous level in a feed that makes up the total ration could be perfectly safe if it comprised only half the ration. Likewise, a safe level in the feed may be a problem if the water also contains high levels of nitrate. Suggestion – Determine nitrate in all suspicious feeds and in the water. Limit the amount of questionable feed. Forages, especially corn and oat silages, green chop or pasture and weeds, are the most common sources of the problem. Limits may need to be greater if the water also contains significant nitrate levels. Nitrate in one dose may be very toxic while the same amount divided into several smaller doses is perfectly safe. For example, in one study, giving a 1000-pound cow 150 grams (about 5 ounces) of nitrate (NO3) in one dose produced acute toxicity. Spraying three times as much, or 450 grams (about one pound) of nitrate on the hay consumed in a day, did not produce acute toxicity. Suggestion – If a feed contains questionable amounts of nitrate, divide the daily feeding into smaller feedings. For example, feed ten pounds of silage 3 or 4 times per day rather than feeding 30 or 40 pounds at one feeding. Nitrate is not normally accumulated in the animal because it is continually converted to ammonia that is utilized in the rumen. The ability to utilize and completely convert the nitrate to ammonia requires adaptation by the animal. A toxic level given to a cow that had been on a very low nitrate intake could be a safe level if the same amount had been gradually added to the ration over two weeks. If a toxic level is fed intermittently, toxicity will occur. Suggestion – If a feed is questionable, feed a small amount for a week; if no problem is noted the amount can be increased. When changing to a new feed or different source of feed, it is always better to make the change gradually. After the animal is adapted to the high nitrate feed, keep feeding it until the feed inventory is completely consumed. Do not skip feeding the high nitrate feed on any day. Safe utilization of nitrate requires general good nutrition and proper rumen function in cattle, sheep and goats. Rumen micro-organisms require readily available carbohydrate, ammonia and minerals. Additional vitamin A reduces the toxic effects of nitrates in poultry. Suggestion – Feed a balances ration. Inclusion of a good grain mix ensures adequate levels of energy and protein. Nitrates might destroy or interfere with the conversion of carotene to vitamin A; therefore, the use of a protein source that contains vitamin A or adding a vitamin A supplement in some way is generally advised when high nitrate feeds are used. Avoid feeding high nitrate feeds to animals that are unthrifty or sick for any reason. Do not feed questionable forages to cows that have impaired rumen function. Elimination of high nitrate feeds from rations for dry and recently early lactation is also a good practice. Nitrates can accumulate in plants when adverse growing conditions such as drought, hot weather, cool weather or frost slows the growth of the plants. Cool season crops such as small grains and permanent forage grasses may accumulate nitrates in hot, dry weather while warm season crops such as corn and sorghums can accumulate nitrates when the temperatures are low or when growth has been arrested due to frost. Suggestion – Nitrates primarily accumulate in the lower stems and leaves of corn, sorghums, small grains, grasses and weeds. They seldom accumulate at sufficiently high concentrations to be a problem in legumes. If the nitrates are suspected to be a problem, avoid harvesting the stalk or stem portions of the plant. Avoid pasturing hungry animals or green feeding on drought stunted crops or weedy pastures. Place suspect crops in the silo and allow to ferment for one to three months before feeding and then follow suggestions given previously. Ensiling will allow conversion of nitrate to ammonia and may reduce nitrate levels by 30 to 50%. Haymaking does not reduce the nitrate level of the forage. Nitrates are hazardous to man. Silo gases are a common cause of both chronic and acute respiratory problems to farmers. When plants are high in nitrate at time of ensiling, various nitrogen gases are formed. Nitrogen dioxide is a brownish yellow gas with a bleach-like odor, that is sometimes seen coming down the silo chute or is layered on top of the silo below closed doors. The gas is heavier than air so it accumulates in low enclosed areas. Nitrogen dioxide is very dangerous to man and animals. Suggestion – Don’t leave the silo room door open to the barn as the gas may come down from the silo and kill animals in the barn overnight. Be sure to ventilate a recently filled silo before entering it by running the blower for several minutes. Open outside doors or windows near bottom of the silo chute and use fan to force gas outside. Escaping nitrogen in the form of gas from the silo reduces nitrate content of silage. Presence of the yellow gas during filling does not mean the silage will be dangerous as a feed, however, it is good evidence that high nitrate was present. Therefore, this silage should be checked for nitrate before feeding. It is difficult to characterize the nitrate content of the corn plant residue. The majority of nitrate is located in the lower one-third of the corn stalk, with much lower levels in the cob, husk, leaves and tassel. Fortunately, cattle quickly learn that they prefer the husk, leaf and tassel parts versus the stalk. It is important that the cattle not be forced to graze the corn stalk in winter. According to the University of Nebraska Corn Stalk Grazing Calculator, one should plan to have the cattle harvest approximately 8 lbs of husk, leaf and tassel per bushel of corn yield. Use corn yield as an indicator of how much feed DM is available to support cattle during corn stalk grazing. Assume that the cattle will eat about 2% of their body weight daily as corn plant DM. Don’t overgraze the corn plant residue. Thus the recommendations would be that an 1000 lb. animal (cattle) would normally consume about 20 lb. of corn plant DM/day. These animals should be fed, so they are not hungry, and then they could be put into the harvested corn field. Corn plant components with up to 2,000 ppm nitrate can be present upon introduction of the cattle with no concern, provided the cattle are not intensely hungry. Cattle will adapt to consumption of feeds with even higher nitrate concentrations, but adaptation over 2 weeks is needed. If levels are higher, then animals should be limit fed during the first 5 days to keep intake below 2500 ppm and gradually increased until consuming 20 lb. of feed containing 4000 ppm nitrate over a period of two weeks (a little below the 4500 to give a little safety factor). For any corn that is chopped and then ensiled, it is important that the anaerobic fermentation process proceed to completion before the silage is fed. Feeding chopped corn the day after it has been chopped could be most lethal method for introducing nitrate-laden feed into the diet of an unadapted bovine. Variations of 100 ppm of NO3-N can be expected due to sampling and analytical errors. Grains and grain products are very low in nitrate and very seldom approach the most conservative guidelines for safe levels. Legume forages such as alfalfa are lower than grass or grain forage. For example, alfalfa silage is lower than corn silage. Nitrate problems are most apt to occur in animals fed mostly forages. The problem is more apt to occur when the forage is primarily non-legume. 1Dan Undersander is in the Department of Agronomy, Dave Combs and Randy Shave are in the Department of Dairy Science, and Dan Schaefer and David Thomas are in the Department of Animal Sciences in the College of Agriculture and Life Sciences at the University of Wisconsin-Madison and the Cooperative Extension Service. 2Much of the material in this publication is from J.W. Crowley. 1985. Effects of Nitrate on Livestock. American Society of Agricultural Engineers. Paper Number 80-20026.